Kicking off Military Appreciation month, Freedom Alliance sponsored a backyard crawfish boil for a platoon at Ft. Campbell, Kentucky, who had just returned from almost a year long deployment in Afghanistan. Kids crowded around wheel barrels full of the freshwater crustaceans — that resemble small lobsters — studying them curiously. They watched as they were rinsed and cleaned with salt water and then dumped into boiling water and cooked with sausage, lemons, potatoes, mushrooms, corn and Cajun seasoning. 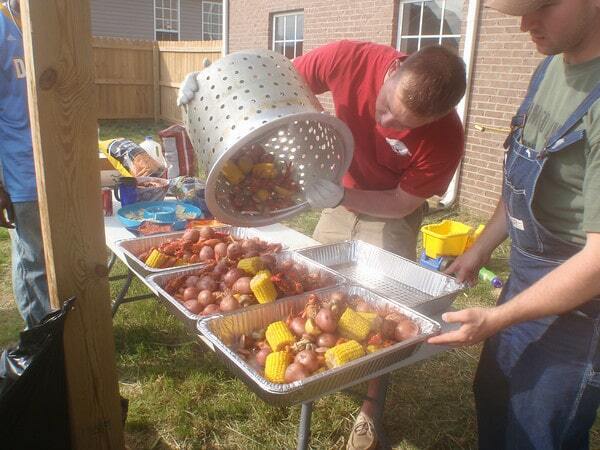 One hundred and thirty pounds of crawfish from the Louisiana Seafood Exchange were cooked through out the evening. Soldiers and wives talked about the best of times and worst of times through out their deployment as they ate their crawfish. The group of 40 couldn’t quite finish off all 130 pounds, but some had room left for dessert, mint chocolate brownies and ice cream. This particular Ft. Campbell platoon deployed in May of 2010, and during the first few months of their deployment secured a section of Highway 1, a main supply route for coalition forces throughout Afghanistan. In the following months, with their Afghan counterparts and with the support of one attached Platoon, they successfully uncovered almost 70 dismounted improvised explosive devices and over 100 hidden Taliban weapons caches. The evening closed with a raffle for two Visa gift cards and a copy of American Heroes signed by LtCol. Oliver North. As the winner of the book scanned through the pages, he spoke of memories from his many deployments and how events like this made his and his families sacrifices worth it.